We don't use our Wii often for games. We originally bought it for doing the exercises that most Wii's were bought for a few years back, but over time, we lost interest in that, and had only kept our Wii to use for Netflix.It was nice therefore to once again for something other than Netflix. Gerry enjoyed trying out The Oregon Trail as he loves westerns. He said it had great graphics,and was easy to use without reading any instructions.As I typed away at my computer,I couldn't help but notice the great sound effects and music that accompanied it. The Oregon Trail was created in 1971 by three student teachers at Carleton College in Northfield, Minn., and immediately became popular throughout Minneapolis public schools. Since that time, the game has gone through a number of editions on a variety of platforms, including Apple II, Macintosh, DOS, Windows and iPhone/iPod Touch. 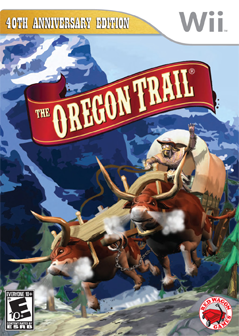 With The Oregon Trail , your job is to lead your family across over 2 000 miles of rough terrain from Independence Missouri to Oregon City in the middle of the 19th century.Gerry said it held his interest, and he got lost in it all. I can see the Wii being used again in the near future for more adventures on The Oregon Trail. ( Please note- this is a single player game). Red Wagon Games would love to give away one of these games in either a Wii or DS platform, to one lucky winner from Canada or the USA. A random draw will be made by Random.org on January 8, 2012 from all entries received. This would make a great birthday gift for my great nephew. Thanks for the chance. I loved playing this game, it was so much fun. I remember playing one of the earliest versions back in the 80's. I love that it still around. My daughter has always loved playing this game on the computer so I would love to win it for her! I loved playing this as a kid. i've played this on the computer years ago and LOVED it- it would be awesome to try on Wii! My kids would like to have The Oregon Trail for the Wii. It looks like a fun game. Hmmm ... can't seem to locate your GFC widget, but I follow with Google Reader. This game looks like alot of fun I could have with the kids! I have never seen it before! I'm sure my son would love this game. Stumbled one of your posts "ELVIS IS ALIVE IN VEGAS"
I've heard that this is a great game!